1.5 kilometers to the west of the Brahmavihara Arama Buddhist monastery is a centuries-old hot spring complex. It's not hard to find the hot springs. Just follow the signs and the lines of souvenir shops. There are four major pools, supplied with amenities such as restrooms, changing rooms, spa and lockers. There's also a restaurant and snacks. Surrounded by lush green tropical vegetation on all sides, the complex is a clean and attractive construct of stone, and the gardens are pretty too. The sulphuric content of the volcanic water that gushes from the cool looking dragon heads is supposed to have a therapeutic effect on bathers. The place starts to get crowded by 10 in the morning so you might want to arrive earlier. Take bemo from Lovina beach to where Jalan Seririt-Singaraja junctions with the road to Banjar Village. From there climb up by foot or take an ojek. 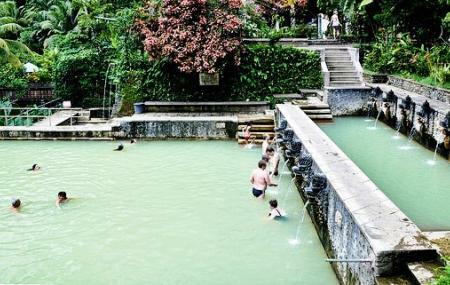 How popular is Banjar Hot Springs? People normally club together Puseh Batuan Temple and Gitgit Waterfall while planning their visit to Banjar Hot Springs. Nice place. Quite and peaceful. Water is really warm and clean. Loved to bath in there. Though I don't know the history behind the hot water but the place is amazing. You should definitely check out this place once. Aside from the incredibly rude guy at the second parking location on the left forcefully and aggressively trying to get a mandatory “donation” to park your scooter this hot spring is well worth the visit. Pretty clean, friendly attendants, working lockers and very therapeutic water features. Just avoid that second parking lot and your good to go. Very nice place. Humble people and all natural. There are 3 ponds. Good for relax. Cheap entrance fee. A relaxing and therapeutic experience that I recommend while in North Bali. There is also a section where there is a strong stream of water which gives you a bit of a massage. There are also markets leading up to the springs. The most popular hot spring in Buleleng regency. Usually crowded in the late afternoon. The perfect time to come here though, is in the morning, where the water is considerably cleaner and feels fresher than in the afternoon. The whole place needs to be cleaner since I feel no change since around 10 years ago. The pool especially needs proper maintenance so that it doesn't look old and dirty. There are also restaurant, food stalls and clothing shop, but you bet it right, they priced higher than the outside. So better be prepared (food is allowed to bring in) or you need to splash extra cash for something you missed.